The landscape has for centuries been a gauge not only of how man perceives the natural world around him visually but also of mankind’s impact upon that environment. Ideally a landscape painting communicates not only the visual attributes of the environment chosen by the artist, but something of the artist within that environment. In choosing a landscape it is often best to stick with the familiar, choosing a landscape that has some meaning for you. Whilst it may be tempting to paint a fantastic holiday scene, seeing the fantastic in even the mundane that you find to hand will more likely ring true in the finished product. Landscape painting throughout the ages has been a great communicator both of the respect and of the disregard that humanity has held for the natural environment. Paintings often reflect either mans subservience to nature, or (as in the case of early 20th Century Futurist Paintings) mankind’s seeming dominance of nature through technology. The latter can be held in either a positive or negative light. It is important to be aware of the commentary that landscape painting reflects upon society, even when there is no, or very little, trace of humanity held within. These days it is liable that any landscape painting undertaken will evoke issues related to nature and Climate Change. The ‘Climate of Change’ exhibition held in London in late 2007 strongly alludes to this and to the concern that artists have for environmental issues. 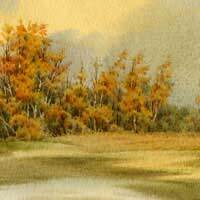 However you choose your landscape painting you will need to take into consideration its composition and this may effect precisely what scene you choose. Whatever landscape you choose to paint from any real life scene, to be readable a painting needs to be composed with equal amounts of activity all over and a central focal point in the middle. This can be seen in any good landscape and will affect exactly what angle you choose to approach your chosen subject from. A good scene can be selected with the help of photographs (taking them can aid composition due to their rectangular format). From this, the photograph areas can be mapped out, by sectioning off the photo with a ruler and pen. These areas can then be drawn to scale on your canvas before painting. This process is called ‘scaling up’. A cityscape is essentially the same as a landscape but set in the city. Cityscapes are often as visually alluring as a landscape, yet the message is more people centred and often more politicised than a landscape, just due to the very nature of the city. Cityscapes may also be favoured by painters attempting to signify the speed of change, or to convey a message that is very ‘now’. These have been favoured in times of intense change, in the beginning of the industrial revolution, and at the start of the 20th Century. A dreamscape is a landscape painting concocted from the workings of the subconscious mind, often drawn from dream experience. As in a dream normal rules concerning space and time may be suspended. Famous artists who painted in this way include Salvador Dali (1904-1989) and Marc Chagall (1887-1985).